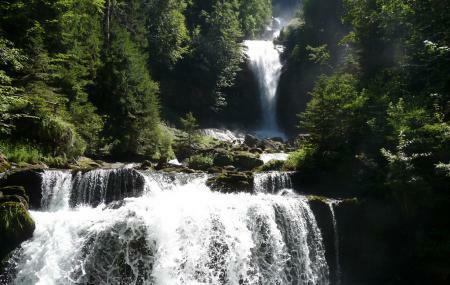 Giessbach is an awesome waterfall located in the beautiful Lake of Brienz. This wonderful waterfall is definitely worth a detour for every tourist. This waterfall is located around beautiful scenery and the entire ambiance of the place is blissful to watch. You will fall in love with the calmness of the place. There is a hotel attached to the waterfall and in case you want to drink a sip of a hot chocolate latte then you must stop in by this restaurant. The view along with the hot drink will increase the charm of the place. How popular is Giessbach Waterfall? People normally club together Ballenberg Open-Air Museum and Ballenberg Open-air Museum while planning their visit to Giessbach Waterfall. We really enjoyed our visit to the falls. We started by going uphill from the parking lot to the observation area, then down the hill, past the hotel to the ferry pier. We then walked back up the west side of the creek and eventually crossing over to the east side to end up at the waterfalls. Good workout and nice scenery. Nice and cosy place. Surrounded by natural forest, waterfalls and the lake of Brienz. Old and perfectly restored hotel. Can be reached by car or cruise ship. Very nice views, hikes, and trail. Well maintained with beautiful view of the falls, the hotel, and lake down below. Well worth the time to visit.